Total Calories: 10 Protein: 9.7g Total Carbohydrates: 0g Fat: 0g Sodium: 50mg Magnesium: 50mg Mutant BCAA 9.7 Blend: 9.7g Instantised BCAAs 2:1:1**: 7.2g Micronised Volumising Aminos**: 2.5g 8 Electrolyte Blend**: 120mg Absorption Agent - BioPerineÂ®**: 5mg Ingredients: **Instantised BCAAs 2:1:1 (L-Leucine, L-Valine, L-Isoleucine), **Micronised Volumising Aminos (Taurine, Glycine, L-Glutamine, L-Arginine, L-Tyrosine), **8 Electrolyte Blend (Magnesium Oxide, Potassium Citrate, Sodium Citrate, Tricalcium Phosphate, Calcium Lactate, Sodium Bicarbonate, Calcium Citrate, Sodium Chloride), **Absorption Agent - BioPerineÂ® (Piper Nigrum [Fruit], 95% Piperine). Other Ingredients: Acidifier: Malic Acid (E296), Sweetener: Acesulfame Potassium (E950), Sweetener: Sucralose (E955), Anti-caking Agent: Silicon Dioxide (E551), Colour: Brilliant Blue FCF (E133), Emulsifier: Soya Lethicin (E322), Natural and Artificial Flavour. Allergens: Contains soy (lecithin). Produced on machinery that also handles ingredients from: milk, wheat, barley, oats, crustacean product (glucosamine), egg, fish, peanut, nuts (including hazelnut, coconut), sesame seed, sulphites. Please Note: Nutritional facts and ingredients may vary slightly between flavours. 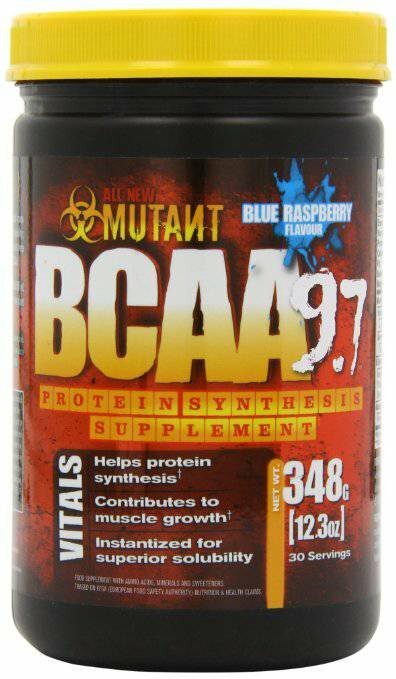 Mutant BCAAs delivers 9.7 grams of amino acids in just 1 concentrated scoop. These BCAAs are in the preferred 2:1:1 ratio and then instantized for superior solubility; with added Micronized Amino Support Stack; and finally magnesium fortified to help contribute to protein synthesis. MUTANT BCAAs beyond just normal BCAAs! Branch Chain Amino Acids are the "Building Blocks" of the body. They make up 35% of your muscle mass and must be present for molecular growth and development to take place. Eight are essential (cannot be manufactured by the body) the rest are non-essential (can be manufactured by the body with proper nutrition). Besides building cells and repairing tissue, they form antibodies, they are part of the enzyme & hormonal system; they build RNA and DNA and they carry oxygen throughout the body. - Available in 3 absolutely great tasting flavours!